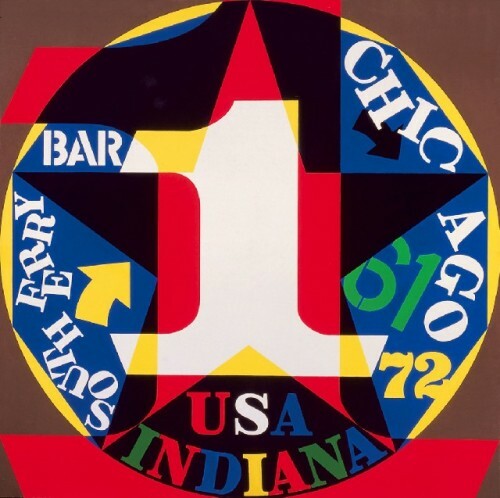 The success of this iconic image proved to be a blessing and curse for Robert Indiana. Images of his adopted parents from hell. 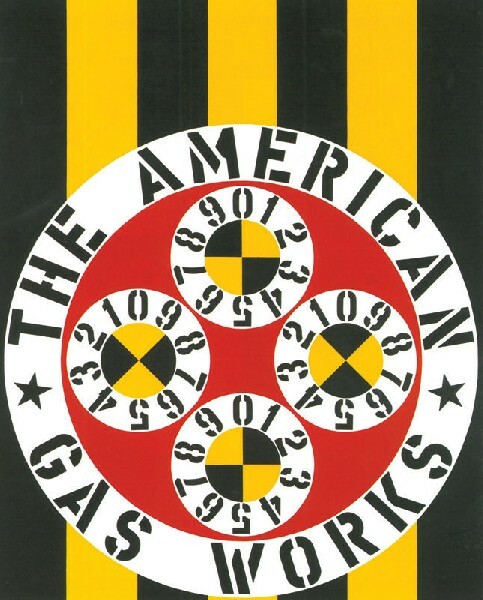 A typical design by Indiana with circles rimmed by stenciled text and a central motif. Homage to "I Saw the Number Five in Gold" by Charles Demuth. A variation of the Demuth based image. 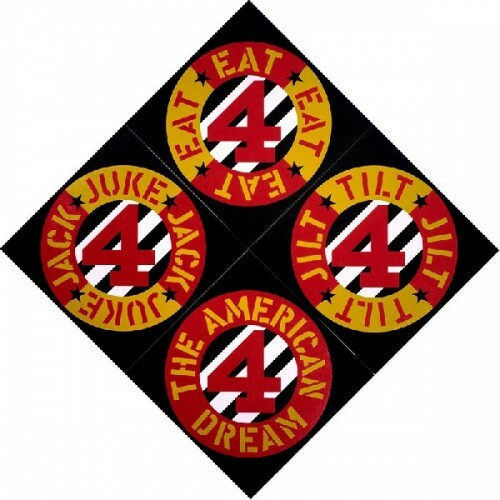 Beware the Danger of the American Dream. 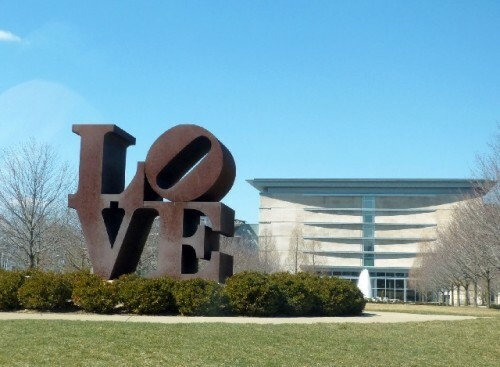 The original Love sculpture by Indiana in front of the Indianapolis Museum of Art. Coming soon to your town. Indiana sculpture from the 1960s. 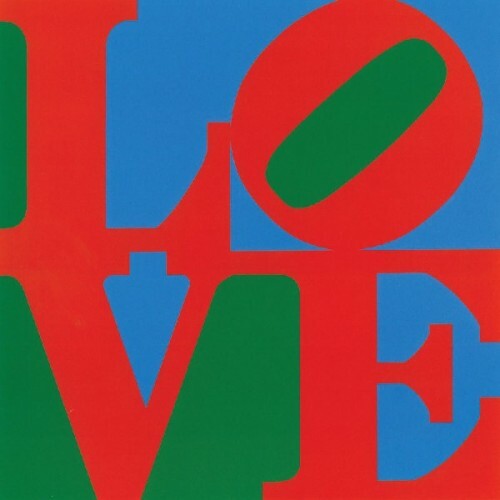 As the title of the exhibition states explicitly Robert Indiana: Beyond Love there is more to the work of this third tier Pop artist than his ubiquitous “Love” logo. While the museum makes its case with a well installed selection of paintings and sculptures from his seminal oeuvre of the 1960s, for me at least, the jury is still out. Perhaps I am alone in that critical position. The artist/ critic Peter Plagens in the Wall Street Journal finds him out of the running of the art world equivalent of an ersatz Pop art Olympic Games. “Andy Warhol, of course, got the gold, Roy Lichtenstein the silver and Claes Oldenburg the bronze.” Actually I don’t know Plagens how came up with those rankings but, good grief, how could he possible snub Jasper Johns and Robert Rauschenberg? Andy, ok. But many art historians would argue with that. Significantly Plagens leaves Indiana out of the running . It is interesting that Plagens insists on seeing art as a palpable competition. Significantly, the art world does not keep score with awards equivalent to Oscar’s, Tony’s and Emmy’s. There is no trade publication like Variety with weekly tallies of attendance and sales for art galleries. Auctions are covered and the reincarnation of the on line Art Net will focus on business news and shun reviews. That bottom line approach confirms that in today’s art world it’s all about the money. One might say hasn’t that always been the case? As Warhol said “"Making money is art and working is art and good business is the best art." Part of the current critical euphoria for Indiana may stem from the fact that the marquee special exhibitions of contemporary art in New York - Christopher Wool at the Guggenheim and German artist Isa Genzken at MoMA- range from mediocre to bloody awful. Compared to what passes for contemporary art nowadays the works by Indiana are as comfortable as a warm bath, shaggy dog, and old shoes. Just about every decade there is a declaration that painting is dead. That started when back in the early years of the 20th century Marcel Duchamp proclaimed painting to be “too retinal.” But in our heart of hearts most of us who grew up on Picasso, Matisse, Pollock and de Kooning with a dash of Rothko have never given up on our passion for painting. Hence a museum retrospective for the painter Wool whose work sells for millions to trustees of museums. Zooming around the spiral ramp at the Guggenheim there was a numbing sameness to the paintings from semiotics to gestural, abstract expressionist weak tea. Compared to which Indiana’s works are rock solid. But does it represent great painting? Pardon me but I find them slick, well designed, graphic and formulaic. That’s not how I felt upon first exposure in the 1960s. Fresh and new, unprecedented, vibrant and original they had a powerful impact. I encountered them while an undergraduate at the Rose Art Museum of Brandeis University. Under its founding director, Sam Hunter, the museum was an early champion of Pop art. Starting a collection Hunter doubled down on Pop with $50,000 in seed money that grew in value to some $300 million. This may be the artist’s first New York museum retrospective but decades ago I met Indiana during his exhibition at Boston/ Framingham’s Danforth Museum of Art organized by former director Joy Gordon. 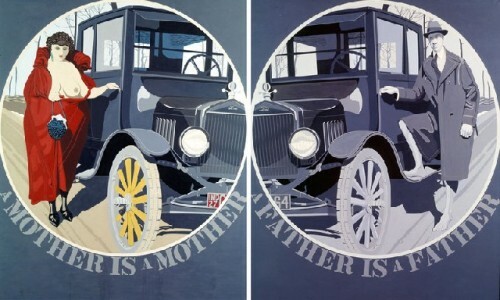 Entering the Whitney exhibition we encounter the diptych “Mother and Father” from 1963-1966. It testifies to the fact that indeed his adoptive mom and dad were a piece of work. Actually these rare figurative works are among the most fascinating in the exhibition. She is depicted as a loose broad with one foot on a Model T Ford flaunting a breast. He is dressed in a similar pose in a top coat and homburg hat, but barefooted and apparently naked. Were his gonzo parents flashers? The artist’s biography reveals that they were indeed whack jobs and he moved some 21 times by the age of 17. There are homages to gay masters of American modernism including Charles Demuth and Marsden Hartley. There are variations on the Demuth painting “I Saw the Number Five in Gold” based on a poem by William Carlos Williams. From Hartley’s German Military Series just prior to WWI are references to Hartley’s officer lover, Karl von Freyburg, who was killed in the war. When Hartley returned to New York from Germany his dealer, Alfred Stieglitz, informed him that he couldn’t sell the German Military paintings. He ordered the artist to paint American subjects which took him from the South West, where he spent time with Georgia O’Keeffe, to Gloucester (The Dog Town series) then Vinalhaven, Maine. Surely Indiana bonded with the imagery of the oppressed Hartley in exile. The somber artist fell in love with local fishermen who were lost at sea. 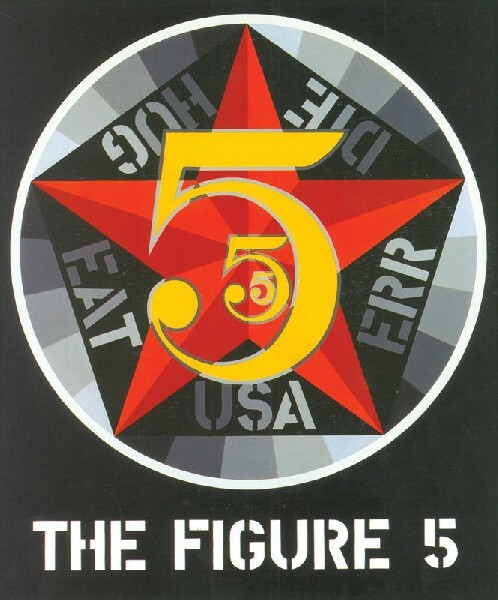 It was innovative when Pop artists emulated the look and techniques of commercial art and design. Lichtenstein borrowed the ben day dots of comic book printing. Warhol, following a successful stint as a commercial artist, created the most fresh and exciting graphic look of his generation. James Rosenquist was a billboard painter before he took that epic scale into the studio. Most pop art reproduces well. It looks great in books and magazines but less so in exhibitions. Except for Jasper Johns whose nuanced encaustic surfaces must be seen first hand fully to be appreciated. Arguably, that is also true for Rauschenberg and Rosenquist. 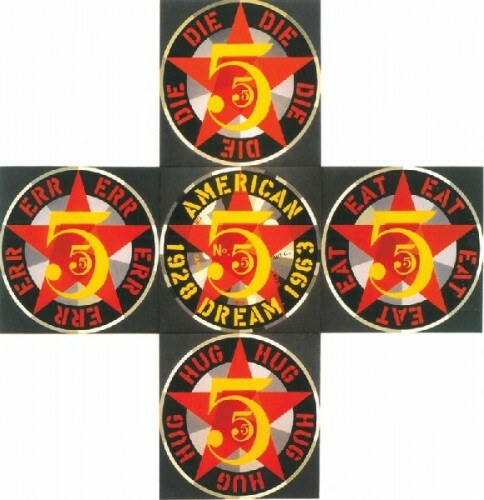 Large exhibitions of the most graphic of the Pop artists, however, prove to be disappointing. Seeing the works first hand, like the Lichtenstein shows at the Guggenheim and Art Institute of Chicago, revealed nothing that we didn’t already know from reproduction. Indiana’s paintings are too mechanical and anything but painterly. They lack a love of the métier and how materials are applied. Looking at a canvas is a dead end. What you see is what you get. The issue here is more than “beyond love” to what about painting? Then there is the “sculpture.” One is a painter or a sculptor. Only in the rarest of instances can an artist succeed in both pursuits. The point of sculpture is that it is three dimensional. The lumbering, literally, works of Indian are not. 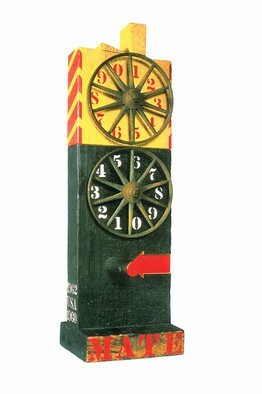 They are flat, vertical, weathered beams with rusty wheels attached and colors applied here and there. On the positive side they were hand crafted by the artist. Where the unquitous “Love” sculptures are fabricated by artisans. We encountered the first of them, in rusted corten steel, in front of the Indianapolis Museum of Art. Initially it had been installed in Central Park in New York. 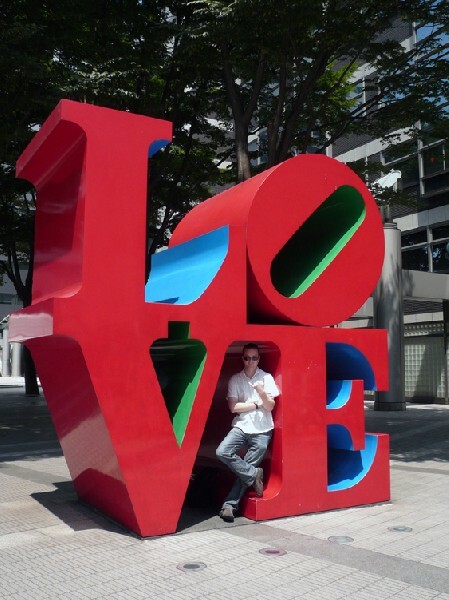 The artist has stated that he would like to see one of his “Love” sculptures in every city in America. That may yet happen. Ok I take it all back. Compared to other museum level exhibitions of contemporary art we have seen recently in Boston, Dublin, London and New York the Indiana show is not that bad. It may even be pretty good. "there were times when rembrandt was in, then he was out,then in again.it is good to see indiana back in because he had been dismissed as too commercial for pop. ironic. by any chance did you see motherwell's collages at the guggenheim. great. his collages seldom work in reproduction. they come off as flat,thin,decorative. in person they are tough,physical,full of tension. he took boldly from picasso,matisse,miro and made them his own. he pushed through with his temperament."